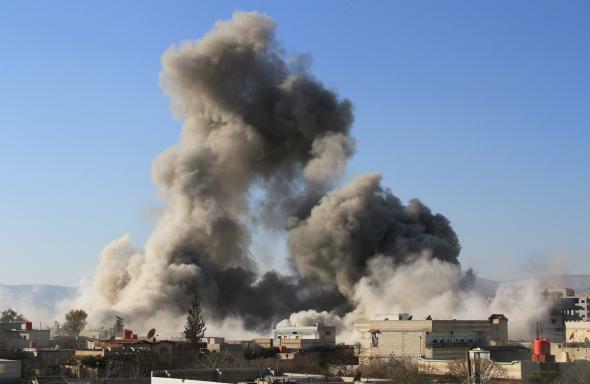 Barrel bombs: Syria's helicopter-dropped, brutally crude new weapon. Smoke ascends after a Syrian military helicopter allegedly dropped a barrel bomb over the city of Daraya, southwest of the capital Damascus, on Feb. 5, 2014. Given all the international attention that has been focused on Syria’s chemical weapons stockpile, it seems almost like a cruel joke that the most brutally effective weapon in Bashar al-Assad’s arsenal these days consists of metal containers packed with TNT, nails, rebar, and machine scrap pushed manually out the back of a transport helicopter. While seemingly of little tactical value, these bombs are brutally effective at causing large amounts of destruction when dropped on civilian areas. The New York Times reports today that the Syrian government’s policy of dropping “barrel bombs”—they are often, though not exclusively, made out of old oil drums—is a large part of what’s driving a massive exodus of refugees from rebel-held parts of Aleppo. As many as half a million people have been displaced to date in one of the largest refugee flows of the civil war, many crossing the border to Turkey. Barrel bombs have been used in Syria since mid-2012 but in the past couple of months, the military seems to have settled on a uniform design for them. This isn’t to say that this is sophisticated technology. All the same, they have the advantage of being cheap to make, easy to deliver, and by all accounts absolutely terrifying to the people under them. In that respect, there is another parallel with chemical weapons. Both have limited tactical value on the battlefield, but are very effective at killing large numbers of civilians as efficiently as possible. Both are a clear signal to Syria’s civilian population of lengths that the regime is willing to go to, but unlike with chemical weapons, Assad appears in no danger of incurring international intervention by dropping barrels full of scrap metal on his own people. *Correction, Feb. 18, 2013: This post originally misspelled Eliot Higgins’ first name.